Song Premiere: Strand Of Oaks, 'Goshen '97' : World Cafe Philadelphia musician Timothy Showalter, a.k.a. Strand of Oaks, has been hailed for evocative songs rooted in fiction, allegory and elaborate fantasy. 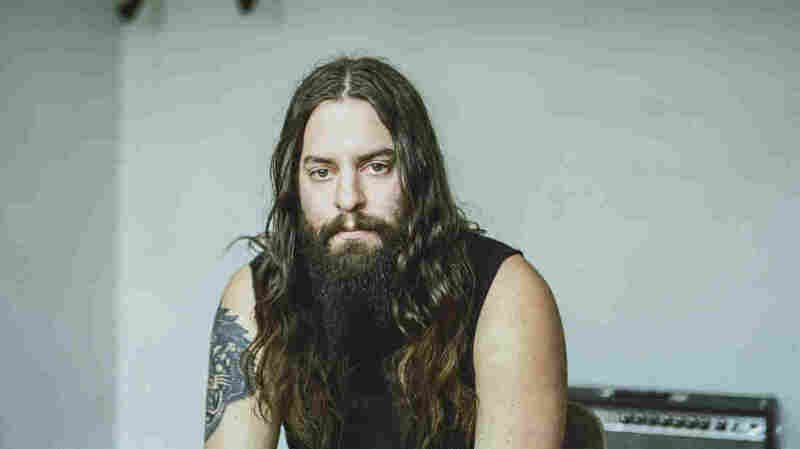 Timothy Showalter, who performs as Strand of Oaks, releasing a new album, Heal, due out this summer. "There's zero symbolism, and that's the scary thing," Timothy Showalter says. "Every single lyric is either a direct thought or a direct event. It's exactly my life." The Philadelphia musician who performs as Strand of Oaks is talking about his new record, Heal, and its visceral opening track, "Goshen '97." Over the course of three LPs, Showalter has been hailed for evocative songs rooted in fiction, allegory and elaborate fantasy. On 2010's Pope Killdragon, he imagined Dan Aykroyd taking revenge on John Belushi's drug dealer; 2012's Dark Shores told stories of alien abduction in a post-apocalyptic world. The music was stunning and cinematic, ranging from solitary acoustic folk to epic synthesizer rock, but the stories were never directly about him. The new Heal, however, showcases Showalter at his most autobiographical, opening with the hammering drumbeat and searing guitar of "Goshen '97." It moves fast and rocks hard, exhibiting an urgency we haven't heard from Strand of Oaks in the past. Showalter describes it as a joyful punk song, with lyrics revealing the little details of life in Indiana at age 15. He hides his packs of menthol cigarettes and lip-syncs to Smashing Pumpkins songs in his mirror. He hangs out in his parents' basement, writing, and discovers his father's tape machine — "and that's where the magic began." "I was lonely, but I was having fun," Showalter sings in the soaring refrain. "I don't want to start all over again." "That's what I never realized before: This is not a bad life," Showalter says. To him, the song represents what it feels like to be a teenager, and what's saving you when you don't fit into narrowly defined teenager roles. Too weird to get invited to the cool-kid parties, too into music to fit in with the Magic: The Gathering crowd, alone and often sad, but with a means of solace. As the album progresses, it follows Showalter on an emotional journey into adulthood. If you think of Heal as his memoir, "Goshen '97" is the introductory chapter, written with the aid of a childhood hero; the ripping guitar you hear was played by Dinosaur Jr.'s J Mascis. "I wanted [to re-create] what it felt like when I heard 'Out There' as a young kid," Showalter says. "I'm just as moved by Mascis' guitar playing as I am by the lyrics." The song is daringly different from Strand of Oaks' output from the past, but Showalter says he's comfortable with that. If you're starting a record this personal, he says, you have to start it at the beginning of you becoming a person. "It's scary to see how little I've actually changed," Showalter says. "I've been around the world, but in a lot of ways, I'm still the same weird kid."